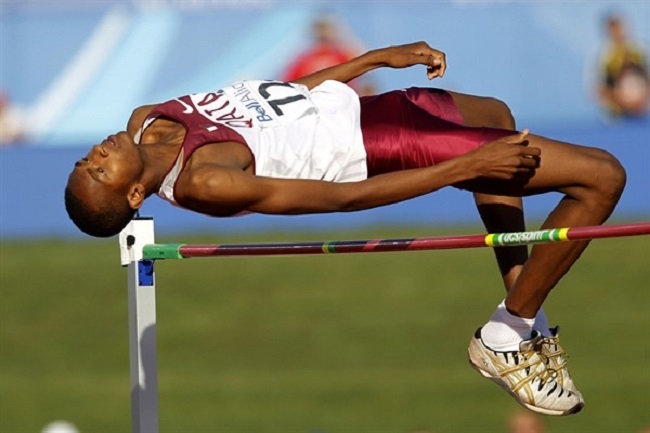 Mutaz Essa Barshim has cleared 7 feet, 11 inches in the high jump. Despite the fame and accomplishments of Muslim athletes like Muhammad Ali, Kareem Abdul-Jabbar and Mesut Ozil, to name a few, there is still a surprisingly high percentage of both Muslims and non-Muslims who are not quite sure if playing sports is encouraged or even allowed in Islam. Allah [swt] has made halal for mankind that which is beneficial to our physical, mental and spiritual health, and has made haram that which is harmful. While there are certain things about the culture humans have cultivated around sports that would fall into the latter category — idolatry, alcohol, steroids, greed, violence, obsession, escapism, etc. — the sports themselves are acceptable as long as we participate without falling into those traps. The most obvious benefit of playing sports is physical fitness, which benefits a Muslim in at least three of Islam’s five pillars: performing daily prayers, fasting during the month of Ramadan, and completing the rigors of the Hajj pilgrimage to Mecca. The Prophet Muhammad [saw] was an athlete in his own right, reportedly participating in running, swimming, archery and horseback riding. And then there is the famous story in which the Prophet [saw] accepted a challenge from Rukaana, a wrestling champion in Mecca, and defeated the renowned strongman — after which Rukaana converted to Islam. In many ways, track and field is the simplest and more pure of modern sports. To paraphrase the USA Track and Field “You’re Welcome” television ad, track and field forms the foundation for almost all other sports. If you want to go deeper, you could use track as a metaphor for life: Getting to the finish line matters, but how you do it — attention to detail, relentless practice, commitment to excellence, learning from mistakes, staying in the right lane — ultimately proves the difference between success and failure. From August 22-30, more than 2,000 track and field athletes representing more than 200 countries will compete for gold, silver and bronze medals at the International Association of Athletics Federations (IAAF) World Championships in Beijing, China. One of the world’s most recognizable and decorated athletes has been in something of an experimental phase since his back-to-back, double-gold performances at the 2012 Olympics (in London) and 2013 World Championships. Set for life as a British national hero and set for a while as the man to beat in the 5,000- and 10,000-meter races, Farah has spent the past year and change trying out the marathon, half-marathon, indoor two-mile (setting a world record) and 1,500 meters. In Beijing, the 32-year-old Farah will get back to his bread and butter, however he will have to overcome off-the-track distractions both good (his wife, Tania Nell, recently gave birth to the couple’s third child) and bad (his coach, Alberto Salazar, was recently accused of providing steroids to athletes). Just 16 years old, Sani Brown is one of the youngest competitors in the World Championship field. He earned his spot among the big boys with a double-gold effort at the 2015 World Youth Championships in Colombia, where he won the 100- and 200-meter sprints with personal-best and meet-record times of 10.28 and 20.34 seconds, respectively. Sani Brown’s time in the 200 is actually the second-fastest in history at the youth level, behind Usain Bolt’s 20.13 seconds. No Japanese sprinter has ever broken the 10-second barrier in the 100 or the 20-second barrier in the 200, something Sani Brown is expected to do before his 18th birthday and before he finishes high school. With the Olympics coming to Tokyo in 2020 — when Sani Brown will be approaching his athletic prime at 20 years old — he is to Japanese track and field right now what LeBron James was to American basketball when he was in high school: the future. Just like New York City is called a hotbed for NBA point guards, and South Florida produces many NFL wide receivers, the central Ethiopian town of Bekoji is known as the birthplace of elite distance runners. Tsegaye’s resume includes victories at the Paris Marathon, Tokyo Marathon, Dubai Marathon and Berlin Marathon — with course records in Tokyo and Paris — as well as second-place finishes in Shanghai, Berlin, Turin, Paris and Toronto. And yet at best, she could only be considered the third-most accomplished runner from her hometown. That’s because Bekoji has also produced Kenenisa Bekele and Tirunesh Dibaba, both three-time Olympic gold medalists and five-time World Champions. 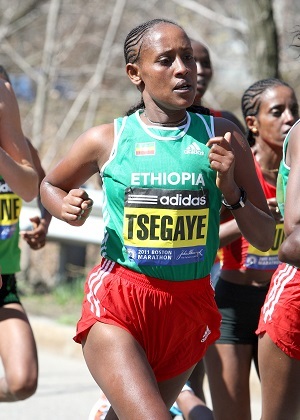 Tsegaye, 30, has yet to win an Olympic or World Championship medal, but she is one of the top marathoners in the world and she is still in her prime; last year she set her personal-best time by covering the 26.2-mile Berlin course in 2 hours, 20 minutes and 18 seconds. Still looking for its first World Championship medal of any color, one of Bosnia-Herzegovina’s best hopes just happens to be in one of this meet’s deepest and most competitive events. The men’s 800 final should be a star-studded affair that includes world record holder David Rudisha (Kenya), reigning world outdoor champion Mohammed Aman (Ethiopia), reigning world indoor champ Ayanleh Soulemain (Djibouti) and 2015 Diamond League leader Nijel Amos (Botswana). But the man with the fastest 800 time in the world this year is Tuka, the 24-year-old who ran 1:42.51 in Monaco on July 17, a race in which he beat Aman and Amos. That two-lap performance was the third time this year Tuka has set his country’s national record in the 800. He also owns Bosnian-Herzegovina’s national record in the 400, with a time of 47.19 seconds. While Tuka taking the title in the men’s 800 would be something of a surprise, a win for Aman would not. The 21-year-old has claimed World Championship gold in each of the last three years: 2012 World Indoor Championships, 2013 World Championships (outdoor), and 2014 World Indoor Championships. 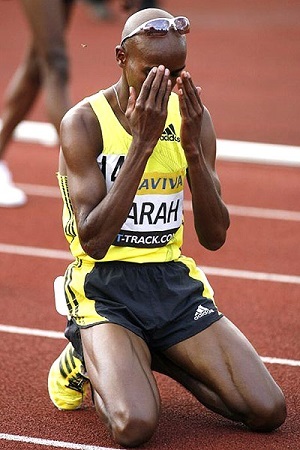 Aman is considered the toughest challenger to Rudisha, having already beaten him head-to-head when Rudisha was arguably the most dominant athlete on the planet. And ever since Rudisha set the world record (1:40.91) at the 2012 London Olympics, Aman’s best times per year have been better than Rudisha’s in 2013, 2014 and 2015. In other words, Rudisha may hold the unofficial title as the fastest 800-meter runner in the world, but Aman has been consistently faster than the fastest for three years running. In an event that has traditionally been dominated by athletes from European and Scandinavian countries, there is a revolution of African and Caribbean javelin throwers challenging the status quo. Kenya’s Julius Yego has the world’s best throw this year at 91.39 meters, while Trinidad and Tobago’s Keshorn Walcott ranks No. 2 with a 90.16-meter toss. A bit further down the list is 26-year-old El Sayed. His best throw of the year, 85.50 meters (over 280 feet), is tied for 10th-best in the world and puts him in legit medal contention at the World Championships. A year ago, El Sayed set a personal best with an 89.21-meter throw, a mark that would’ve been good enough to win a gold medal at the last World Championships in 2013. 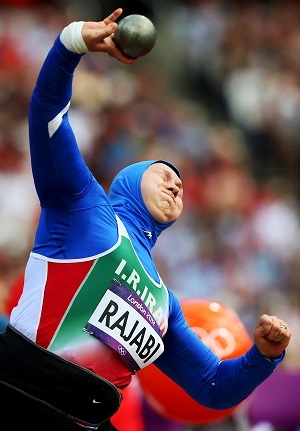 Born in Belarus, Rajabi converted to Islam and decided to represent Iran in athletic competition after marrying Iranian sprinter Payman Rajabi. With the latter decision she immediately became the best female shot putter in Iran, breaking the national record in her first meet by more than three meters. Rajabi, 32, owns gold medals from the 2009 Asian Indoor Games, 2010 Asian Indoor Championships and 2013 Islamic Solidarity Games in Indonesia. At last year’s Asian Games she took home the silver medal. Rajabi’s best throw so far this year measured 18.04 meters (over 59 feet), making her one of the top 30 shot putters in the world and coming up just shy of her personal best of 18.13m. The steeplechase is the oddball obstacle course of track and field; a blend of traditional distance running, cross country, and a child’s fun summer day of jumping over stuff and splashing in a wade pool. At 21 years old, Guvenc is one of the rising stars in the event, and the World Championships could be the stage on which she makes her name among the steeplechase elite and becomes known to a legion of track fans outside of Turkey. This summer, Guvenc won a gold medal at the European Under-23 Championships in Estonia, setting a meet record by finishing in 9:36.16. Earlier this year she also established her personal best time of 9:33.34, putting her among the top 25 female steeplechasers in the world going into the biggest meet of her nascent career so far. Only six 400-meter hurdlers — five Americans and one Kenyan — have posted faster times this year than the 26-year-old Hussein, whose 48.45-second season’s best is better than that of 2012 Olympic bronze medalist Javier Culson, 2015 Pan Am Games gold medalist Jeffery Gibson, and three-time African Championships gold medalist L.J. Van Zyl, among others. Hussein is the reigning European champion in an event that a lot of people who follow track believe is the toughest in the sport; one that requires equal parts speed, strength, endurance, technique and strategy. This is either a sign of how good Barshim has become, or a sign of how how high expectations are for him: In 2015, he owns the two best high jumps in the world (2.41 meters on May 30 in Oregon; 2.38m on May 17 in Shanghai), and he currently sits atop the Diamond League standings — and yet this has been considered a down year for the 24-year-old human pogo stick. Barshim finished third at the Asian Championships, and despite his overall No. 1 Diamond League ranking (think of the Diamond League like track’s version of the UEFA Champions League), he hasn’t won in four straight Diamond League meets. In 2014, Barshim won the Diamond League title and gold medals at the World Indoor Championships, the Asian Games (outdoor) and the Asian Indoor Championships. He also turned in a personal-best jump of 2.43 meters (over 7 feet, 11 inches) that is the second-best in history. Maybe it’s because it seemed a foregone conclusion that this would be the year Barshim breaks Javier Sotomayor’s world record of 2.45 meters that has stood since 1993, but the book on Barshim going into the World Championships is that he’s struggling. It will take only one giant leap in Beijing to change that narrative, but it’s a leap that has eluded him all year.